Teresa Garland, MOT, OTR/L, is an occupational therapist and author specializing in sensory and modulation issues. She has worked in schools, sensory clinics and medical settings with children and adults, treating sensory disorders, ADHD and autism. Ms. Garland works closely with other health professionals, teachers and doctors to understand and treat underlying sensory, timing, and coordination/motor planning issues as well as overlying socio/emotional behaviors in the symptoms of autism. She is trained/certified in the SIPT, Interactive Metronome®, Integrated Listening Systems (iLs), Therapeutic Listening, Wilbarger’s Sensory Defensiveness, the Natural Heart Approach, Mindfulness Training, and Food Chaining. Her bestselling books are titled Self-Regulation Interventions and Strategies: Keeping the Body, Mind and Emotions on Task in Children with Autism, ADHD or Sensory Disorders (PESI, 2014) and Hands-on Activities for Children with Autism & Sensory Disorders (PESI, 2016). "Teresa Garland has captured the essece of using the occupation of play to enrich the lives of the children we all adore. Having several years of experience working with children diagnosed with Autism, and sensory disorders, I have a solid appreciation for effective practice. Teresa manages to expound upon evidence-based strategies packaged for parents, teachers, and therapists alike. Her book encompasses techniques draped in the strongest aspects of sensory gross motor, and emotional approaches. It is a beautiful arrangement that allows the reader to apply aspects of occupational therapy, and related fields, to simplstic and enjoyable activities. Teresa continues to contribute to our field by translating and demystifying therapeutic strategies to everyday life!" "Teresa Garland has done it again! Another excellent activity book that provides detailed treatment protocols with amazing visuals and hands-on activities for therapists to use with children with sensory impairments." "Anyone involved in the life of a child who have autism or a sensory modulation disorder will treasure this resource. 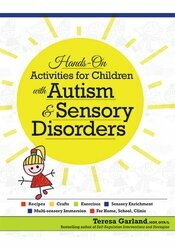 Ms. Garland has done the heavy lifting to produce a detailed, accessible guide with fresh and practical sensory activities. Especially helpful are her recommendations for grading activities from very simple to more complex. These activities will not only revitalize interventions for therapists but also equip motivated do-it-yourself parents to engage in sensory learning with their children."